Versatility is the catchword for the PPX2055, thanks to its small size, big output and the fact it's USB powered. Great for small-scale presentations. 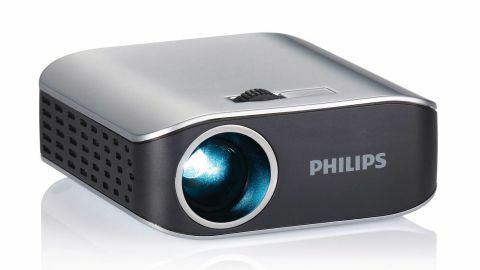 Selling for a hugely discounted £120 at the time of writing, this tiny LED projector from Philips with the now familiar 'pico' moniker weights just 114g. Easily small enough – at 72 x 72 x 27 mm – to fit in a jacket pocket for instant on-the-go presentations, the PicoPix PPX2055 relies on just one cable for both power and pictures. Half the size of a camera and designed to pair-up with a laptop or Ultrabook, the PicoPix PPX2055 has a resolution of 854 x 480 pixels, so isn't capable of showing native HD content. Don't be fooled into thinking the PicoPix PPX2055 provides an instant home cinema experience from your pocket. At just 55 lumens of brightness, you're going to need as near to a blackout as possible for the PicoPix PPX2055 to do its job, though its makers claim it can produce an image as big as 120-inches. If that's huge, the rest of the PicoPix PPX2055 screams tiny. Shipping with a tiny fabric pouch that looks like it could do with a belt holster – it's that small – the package also contains a cable with a mini USB termination on one end. Set-up wasn't quite as easy as we'd hoped. We linked-up the PicoPix PPX2055 to a MacBook Air, and though the projector appeared as a drive, there was no Mac software available, just the PicoPix viewer 2 Setup.exe file. However, a 'visit us' weblink took us to the Philips support page, from where we manually found the correct drivers for Mac OS X (along with individual downloads for Windows XP, Vista, 7 and 8). Unfortunately, the reboot required just wasn't possible with the PicoPix PPX2055 attached without first crashing the MacBook Air, so we had to abandon this particular test. Hmm. The same process on a netbook running Windows Vista worked fine; the Picopix Viewer 2 software loaded up quickly and gave us a choice of mirroring our netbook's screen on the PicoPix PPX2055 or extending it to become a second screen, as well as choosing between three brightness levels. Placement is a trade-off. From about 2.5m from a screen we achieved an 80-inch image, though there are issues that render this a bit pointless; the image is just too soft, and it's not bright enough. Put a good deal closer, at about 90cm from a screen, and we managed a perfectly sharp, bright 50-inch image, so it's here that we'd set its usable limit. Focussing it via the PicoPix PPX2055's only physical control (a small wheel above the LED lens that's rated to last 30,000 hours) its RGB LED lamp produced colourful images with plenty of contrast, though it's much better with the bold colours of presentations and graphics than with the skin tones of movies and TV. Detail depends on placement, but on a 50-inch image it's enough for most presentations. One issue is loudness. The spinning DLP colour wheel is always audible, so it's worth considering drowning out the sound with a simple wireless Bluetooth speaker to connect up to the laptop you're using. We also noticed that the USB cable used is very stiff, and can easily jog the (exceptionally lightweight) projector itself. So does this pocket-sized projector offer enough to light up the market? Since there are no controls on the PicoPix PPX2055 itself, the Picviewer 2 software is all-important – and highly impressive. It's rudimentary in terms of design, but keeps things ever so simple. Engaging the PicoPix PPX2055 is no more complicated than choosing a shortcut on the desktop of a laptop, and hitting OK on the first and only set-up screen. Picture quality isn't akin to a home cinema of any kind – it's neither bright nor nuanced enough – but it's certainly good enough to get anyone wondering what an extra few hundred lumens could do. A contrasty, sharp enough 50-inch image is assured – and that's probably plenty for most small-scale presentations. Great though it is, we can't recommend the PicoPix PPX2055 with a MacBook Air since it crashed ours during tests. In use it's quite loud, running at an average of 50 decibels, though it fluctuates randomly, and peaks at 60 decibels. As no speakers are supplied you have to rely on your laptop's; we swerved this for our test presentation by carrying a mini Bluetooth speaker, which we positioned underneath the PicoPix PPX2055's projection. While it would be great to have the option of connecting a USB stick for laptop-less instant presentations – as seen on previous incarnations of the PicoPix – that would necessitate both a battery and an array of controls on the device itself. Considering it's 25% the size and price of most portable data projectors, Philips PicoPix PPX2055 is very appealing. OK, so it's not going to blow off any socks, and nor is it great for watching movies, but it gets so close to versatility that we're impressed. It manages a reasonably sharp-looking 50-inch image, which should do very nicely for small-scale presentations, and we love its powered-by-USB feature – the lack of a dedicated power cable really pushes it portability claims.